Born and educated in Winnipeg, Marvyne has lived in the Toronto area for most of her adult life. 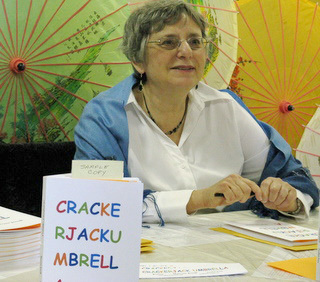 Her writing includes several books of poetry and experimental fiction published by Canadian literary presses. In recent years she has focused on the visual arts, working in watermedia, photography, and collage and assemblage. She describes her creative processes in an essay, “Alive, Unique” in Imagination in Action: Thoughts on Creativity by Painters, Sculptors, Musicians, Poets, Novelists, Teachers, Actors…, edited by Carol Malyon, Toronto: The Mercury Press, 2007. Available on my blog, www.imaginativeforays.wordpress.com. During Nuit Blanche in June, 2008 a portrait of Marvyne was hung in Brookfield Place as part of Luminato’s Mille Femmes.This tribute to women in the arts in Toronto is one aspect of French photographer Pierre Maraval’s international Human Landscape project. 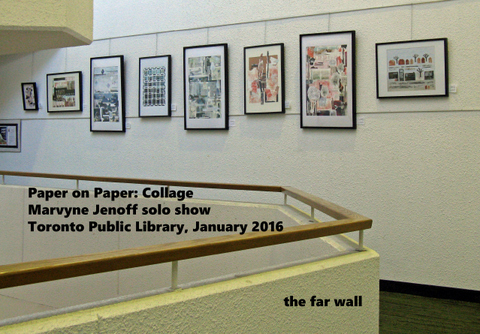 Skylight Gallery, Northern District Library, Toronto; all of January. April 2 to 10 (image at left). ▪ Five photographs from the Boudoir Series in the Arts & Letters Club annual Small Works Show and Sale. ▪ Seven Pencils, limited edition photograph, in Mistletoe Magic Silent Auction at the John B. Aird Gallery. ▪ Blue View, mixed media collage, in the CFS 62nd Open Juried Exhibition at the Etobicoke Civic Centre Gallery. ▪ Leaf Press's Monday's Poem features Marvyne's "Summer Story, Yonge and Eglinton"
▪ New chapbook from Twoffish Press: Embracing Minutiae, literary humour, personal essays. ▪ Pink Park, mixed media collage in The Arts & Letters Club Members' Fall Group Show. ▪ Winter Song, watermedia collage in the Society of Canadian Artists Members' Show, The Etobicoke Civic Centre Art Gallery. ▪ Path, watermedia collage in The Arts & Letters Club Members' Summer Group Show. 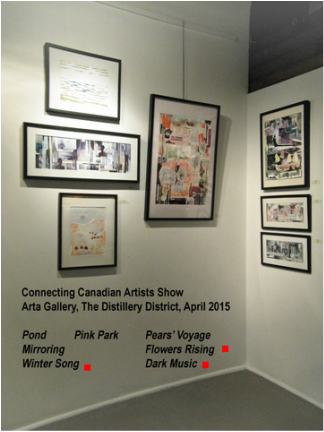 ▪ a collage and a photograph in the Valentine Group Show, Gallery Hittite, 107 Scollard Street, Toronto. ▪ Two lines by Marvyne, beginning "Dust, lust and miracles...," in Leaf Press Co-operative New Year's Poem. ▪ Photographs on the wall and books for sale at The Arts & Letters Club annual Small Works Show and Sale. 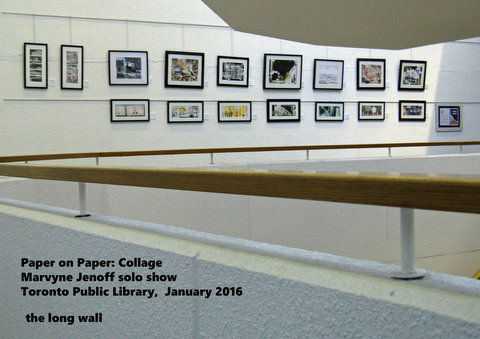 ▪ Solo show (July), Words, Water, Light: text based watermedia paintings and abstract photography, Skylight Gallery, Northern District Library (image at right). ▪ Three photographs in The Hot Shots Photography Show, The Arts & Letters Club of Toronto. ▪ Two mixed media pieces in The No Boundaries Contemporary Show, The Arts & Letters Club of Toronto. ▪ Watermedia Collage, Forest Song, #1, in The Colour and Form Society's Members' 60th Anniversary Show, "Canadian Landmarks,"Joseph D. Carrier Art Gallery, Columbus Centre: Honourable Mention. ▪ Books and small photographs at the Arts & Letters Club Annual Sale of Members' Work. ▪ Watermedia painting, "Wide Silence, Round Sound, #1" in The Colour and Form Society's 60th Annual Open Juried Exhibition, Etobicoke Civic Centre Gallery. ▪ Table for Twoffish Press and Marvyne's other writing at Meet the Presses' Third Indie Literary Market. ▪ Photograph, "Purple Shamrock #5470," in The Arts & Letters Club's Black Frames Show. ▪ Collage, “Forest Song, #1,” in the Arts & Letters Club’s The Art of Line Show. ▪ Table for Twoffish Press at The Small Press of Toronto Book Fair. ▪ Photographs and books in The Arts & Letters Club’s Small Treasures: Sixth Annual December Show and Sale. ▪ Two watermedia pieces in The Colour and Form Society’s 59th Annual Open Juried Show, Etobicoke Civic Centre Gallery. ▪ Watermedia painting, “Each Fresh Page Already Fraught with History, #2,” in The Colour and Form Society’s Members’ Show, Gallery 1313, Queen Street West, during Nuit Blanche. ▪ Table for Twoffish Press at the Meet the Presses Screaming Chapbook Market, Clinton's Tavern. ▪ Watermedia painting, "Wide Silence, Round Sound, #1," in The Society of Canadian Artists 43rd Annual Open Juried Exhibition, The Papermill Gallery, Todmorden Mills. ▪ Eleven Abstract photographs over four juried group shows at The Arts & Letters Club of Toronto, three of them during Doors Open in May. ▪ Solo show (September), Wide Silence, Round Sound: Lyrical Conceptual Watermedia Paintings Based on Text, The Great Hall, The Arts & Letters Club (image below). ▪ Co-ordinated The Arts & Letters Club of Toronto Fifth Annual December Show and Sale of Art, Books, and CDs by Members. Some of her books and photographs were displayed and for sale. ▪ Publication of An Evening of Poetry (chapbook, Twoffish Press). ▪ One watermedia piece, Each Fresh Page Already Fraught with History, #4, in The Society of Canadian Artists' 42nd Annual Open Juried Exhibition, The Papermill Gallery, Todmorden Mills. ▪ Photographs in the Raymond Chang School, Ryerson University Eyes of Experience Show, Commerce Court. ▪ One watermedia piece, Hush, the Sibilant Rain, #1, in the Colour and Form Society Biennial Open Juried Exhibition, The Papermill Gallery, Todmorden Mills. ▪ Work in juried group shows, The Arts & Letters Club. ▪ Solo Show (February), Light and Water: Experimental Photography and Watermedia, The Skylight Gallery, Northern District Library. ▪ Twoffish Press table at The Small Press Book Fair of Toronto, Gladstone Hotel. ▪ Poetry reading at the Ice, Wine, and Dine party on Elm Street, The Arts & Letters Club. ▪ Four pieces in Whodunit? OCAD Mystery Art Sale. ▪ A photograph in Hidden Gems, Toronto School of Art 40th Anniversary, The Berkeley Church. ▪ One piece in The 14th Annual Shadow Box Silent Auction, The Textile Museum of Canada. 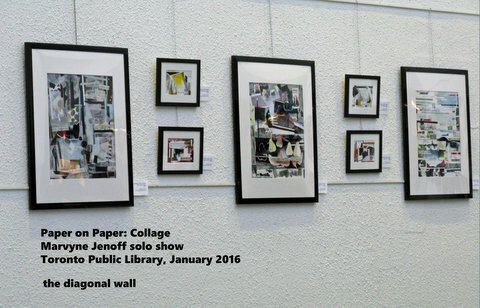 ▪ One piece in Photo-op: A Juried Photography Exhibition, The John B. Aird Gallery. ▪ Book table at Doors Open, The Arts & Letters Club. ▪ Work in juried group shows, The Arts & Letters Club..
▪ Launch of Crackerjack Umbrella (poetry, Twoffish Press) (image at left); readings, radio interview (CIUT Howl), participation at book fairs. ▪ Photographs at the Arts and Letters Club Centenary International Exhibition and the Small Works Show and Sale.